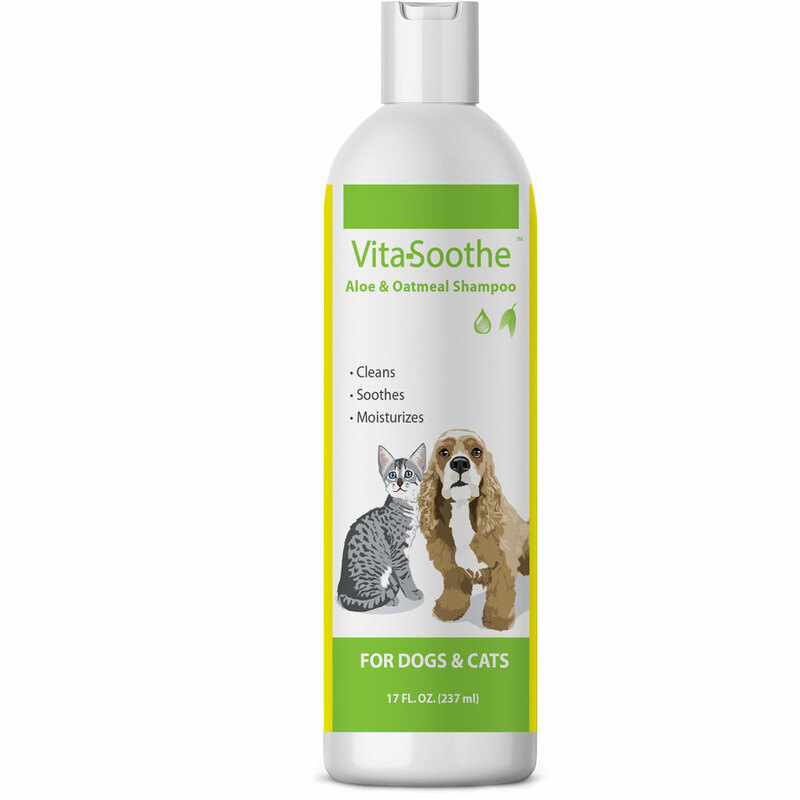 Vita-Soothe™ Aloe & Oatmeal Shampoo is designed for a dog or cat that has itchy, scaling or sensitive skin. 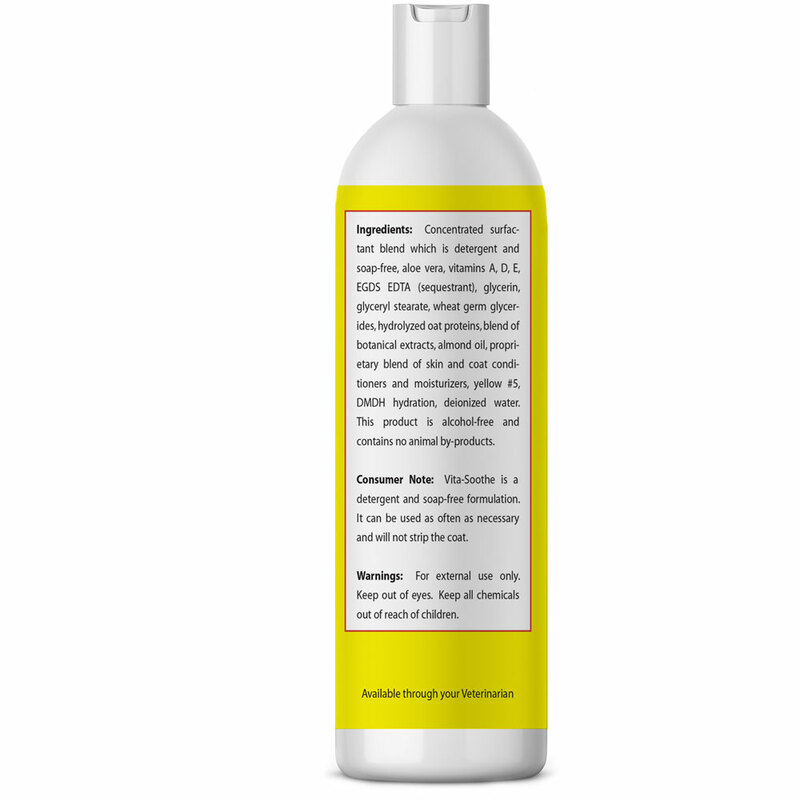 This shampoo will clean and soothe as it improves skin and hair. Vita-Soothe is a natural product without harsh chemicals that uses soothing aloe, the whole natural goodness of oatmeal, along with vitamins and emollients to restore moisture to your pet's skin. 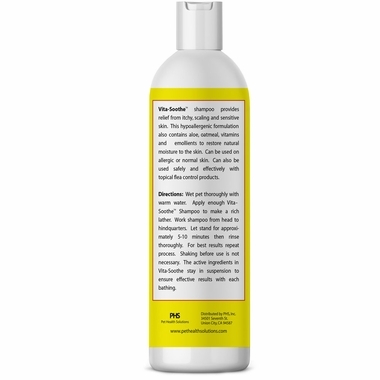 It does so with a hypoallergenic formula that utilizes gentle ingredients with your pet's hair and skin in mind. Vita-Soothe is a detergent and soap-free formulation. It can be used as often as necessary and will not strip the coat. 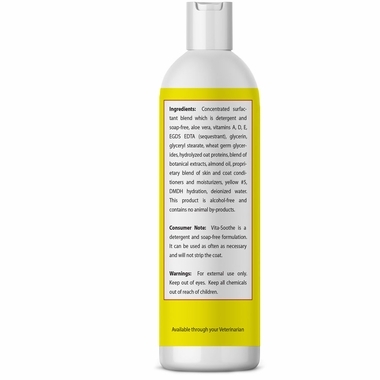 Concentrated Surfactant Blend (Detergent and Soap-Free), Aloe Vera, Vitamins A, D, E, EGDS EDTA (sequestrant), Glycerin, Glyceryl Stearate, Wheat Germ Glycerides, Hydrolyzed Oat Proteins, Blend of Botanical Extracts, Almond Oil, Proprietary Blend of Skin and Coat Conditioners and Moisturizers, Yellow #5, DMDH Hydration, and Deionized Water. This product is alcohol-free and contains no animal by-products. Shaking before use is not necessary. The active ingredients in Vita-Soothe stay in suspension to ensure effective results with each bathing. Wet pet thoroughly with warm water. Apply enough Vita-Soothe Shampoo to make a rich lather. Work shampoo from head to hindquarters. Let stand for approximately 5-10 minutes then rinse thoroughly. For best results repeat process. ConsDoesn't indicate anywhere on the bottle or description that it smells like coconut. It is just exactly what I was looking for...thanks. My pair of darling Sheltie sisters have long, silky fur and I truly LOVE absolutely everything about this gentle shampoo for their velvety coats. It has a creamy, rather thick consistency and only a fairly small amount is needed to create a rich lather. And because it so thoroughly rinses out, no residue is left on their sensitive skin, or on the teeth of their grooming combs. It leaves their fur very soft, without any tangles, and with a really nice *fresh clean* scent! I've tried expensive, prescription shampoos and this is just as good but half the price. My Pug has itchy skin but this shampoo really relieves him. I use once a month. ProsRelives itchy, red skin allergies. ConsWish this brand had a cream rinse or leave-in conditioner too. I found my dog in the street and he had an infection on his skin from allergy to fleas. He had so much dander! I started using Vitasoothe along with meds and right away both the vet and I noticed the difference. I have never stopped using it in the two years he has been with me. His coat is so nice now and no dander. He once had a coat that would make you feel sorry for him but now people admire it. I have a cat that has senstive skin and allergies to flea dander.We had a bad summer last year and finally got it under control.Well he\'d licked his stomach bald in 2 spots from the dander.This shampoo has really helped him not over lick fur.It also seems to help control his shedding! He\'s a short haired Siamese, who\'s beautiful markings were not so cute.lol.Hope this helps someone else.